Bali Traditional Tour This is women's Gamelan group. A Gamelan is a traditional musical ensemble from Indonesia. It is the main element of the Indonesian traditional music. Each Gamelan is slightly different from the other. Mysterious and elegant sound. I thought that gamelan is played only by men, but this gamelan music is played by women!! 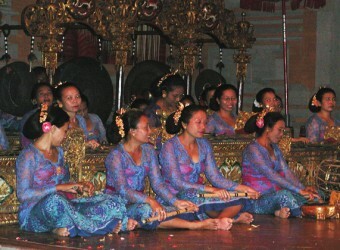 Women dressed in flamboyant costumes played the gamelan. It`s different from gamelan played by men, powerful sound! And I think it has nice melody.